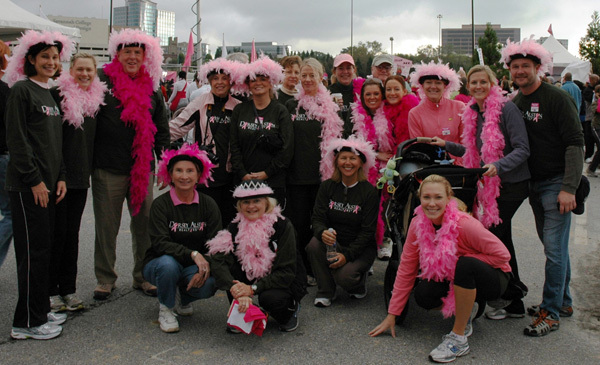 ATLANTA – For the second year in a row, Dorsey Alston, Realtors®, team Cure or Bust, led by agent Karen Mullinax, came out to show their support in the fight against breast cancer on Saturday, October 24, 2009. The three-mile walk began and ended at Atlantic Station in Midtown, where more than 16,000 participants joined together for the 11th annual Making Strides Against Breast Cancer Walk. The American Cancer Society raised more than $1.1 million for this year’s walk, with an additional 4,000 more people walking this year than in 2008. Twenty Dorsey Alston team members walked this year; the office raised $3,160 for the American Cancer Society. Dorsey Alston showed team pride with a specially-designed t-shirt for the walk in addition to pink feather boas and bowler hats also adorned with boas. The walk not only honors everyone touched by breast cancer but also raises money to enable the American Cancer Society to fund ongoing research, provide cancer prevention and early detection information, and help ensure all women have access to mammograms and follow-up care. Making Strides Against Breast Cancer is a great way to fight back against breast cancer and provide hope to all people facing the disease. Making Strides is not a race; it is a celebration of survivorship, an occasion to express hope, and a shared goal to end a disease that threatens the lives of so many people we love. Thanks to events like this, we can – and will – save lives. Congratulations and thank you to all who participated in the Making Strides Against Breast Cancer Walk. Together we will make a difference, make history and make strides.